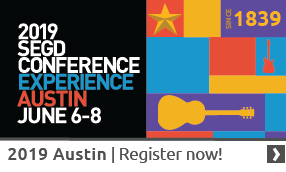 Attendees at DesignX—SEGD’s design-focused event at Digital Signage Expo 2016—will get a double-value experience: Heads (filled) up during a full-day workshop on planning and designing digital user experiences, and hands-on during a guided morning tour of the DSE 2016 show floor, where they’ll get to see, touch and feel the latest digital technology products, platforms and applications. You should be there March 15-16 in Las Vegas! Make yours a double! Behind the smart digital experiences you create for your clients, there are multiple layers of technology, hardware, platforms and providers to sort through. Douglas Hampton-Dowson of Reality Interactive will help you “Deconstruct the Technology Stack” with a guided tour of the Digital Signage Expo show floor March 16. It’s all part of SEGD’s DesignX partnership with DSE. Tearing yourself away from the office for a professional development day isn’t easy, especially when there’s no clear value proposition. But DesignX is an obvious value-add. The digital world is advancing fast—will you be ready when your clients want to add an interactive user experience or media component to their project? Join us at DesignX—March 15-16 during Digital Signage Expo 2016 in Las Vegas—and leave with (at least) 10 new tools to help you design smart, user-centered digital experiences.